Norse or Scandinavian mythology comprises the pre-Christian religion, beliefs and legends of the Scandinavian people, including those who settled on Iceland, where the written sources for Norse mythology were assembled. (When using the term "Scandinavian," however, it is important to note that Finnish mythology forms a separate creed, although it shares some similarities with Norse mythology.) Norse mythology is the best-preserved version of the older common Germanic mythology, which also includes the closely related Anglo-Saxon mythology. Germanic mythology, in its turn, had evolved from an earlier Indo-European mythology. Norse mythology is a collection of beliefs and stories shared by Northern Germanic tribes. It was not a revealed religion, in that it was not a truth handed down from the divine to the mortal (although it does have tales of normal persons learning the stories of the gods from a visit to or from the gods), and it had no scripture. The mythology was orally transmitted in the form of long, regular poetry. Oral transmission continued through the Viking Age, and our knowledge about it is mainly based on the Eddas and other medieval texts written down during and after Christianisation. In Scandinavian folklore, these beliefs held on the longest, and in rural areas some traditions have been maintained until today. Others have recently been revived or reinvented as Germanic Neopaganism. The mythology also remains as an inspiration in literature (see Norse mythological influences on later literature) as well as on stage productions and movies. In Norse mythology, the earth is represented as a flat disc. This disk is situated in the branches of the world tree, or Yggdrasil. Asgard, where the gods lived, was located at the centre of the disc, and could only be reached by walking across the rainbow (the Bifröst bridge). The Giants lived in an abode called Jötunheimr (giant realm). A cold, dark abode called Niflheim was ruled by Hel, daughter of Loki. According to the Prose Edda this was the eventual dwelling-place of most of the dead. Located somewhere in the south was the fiery realm of Muspell, home of the fire giants. Further otherworldly realms include Álfheim, home of the light-elves (ljósálfar), Svartálfaheim, home of the dark-elves, and Nidavellir, home of the dwarves. In between Asgard and Niflheim was Midgard, the world of men (see also Middle-earth). The cosmology of Norse mythology also involves a strong element of duality: for example the night and the day have their own mythological counterparts Dagr/ Skinfaxi and Nótt/ Hrímfaxi, the sun and the chasing wolf Sol and Skoll, the moon and its chasing wolf Mani and Hati, and the total opposites of Niflheim and Muspell is the origin of the world. This might have reflected a deeper metaphysical belief in opposites as the foundation of the world. There are three "clans" of deities, the Æsir, the Vanir, and the Jötnar (referred to as giants in this article). The distinction between Æsir and Vanir is relative, for the two are said to have made peace, exchanged hostages, intermarried and reigned together after a prolonged war, which the Æsir had finally won. Some gods belong in both camps. Some scholars have speculated that this tale symbolized the way the gods of invading Indo-European tribes supplanted older nature-deities of the aboriginal peoples, although it should be firmly noted that this is conjecture. Other authorities (compare Mircea Eliade and J.P. Mallory) consider the Æsir/Vanir division to be simply the Norse expression of a general Indo-European division of divinities, parallel to that of Olympians and Titans in Greek mythology, and in parts of the Mahabharata. The Æsir and the Vanir are generally enemies with the Jötnar (singular Jötunn or Jotun; Old English Eotenas or Entas). They are comparable to the Titans and Gigantes of Greek mythology and generally translated as "giants", although " trolls" and " demons" have been suggested as suitable alternatives. However, the Æsir are descendants of Jötnar and both Æsir and Vanir intermarry with them. Some of the giants are mentioned by name in the Eddas, and they seem to be representations of natural forces. There are two general types of giant: frost-giants and fire-giants. There were also elves and dwarfs, whose role is shadowy but who are generally thought to side with the gods. In addition, there are many other supernatural beings: Fenrir the gigantic wolf, and Jörmungandr the sea-serpent (or "worm") that is coiled around the world. These two monsters are described as the progeny of Loki, the trickster-god, and a giant (Hel is the third of these offspring). More benevolent creatures are Hugin and Munin (thought and memory, respectfully), the two ravens who keep Odin, the chief god, apprised of what is happening on earth, and Ratatosk, the squirrel which scampers in the branches of the world ash, Yggdrasil, which is central to the conception of this world. Along with many other polytheistic religions, this mythology lacks the good-evil dualism of the Middle Eastern tradition. Thus, Loki is not primarily an adversary of the gods, though he is often portrayed in the stories as the nemesis to the protagonist Thor, and the giants are not so much fundamentally evil, as rude, boisterous, and uncivilized. The dualism that exists is not good vs evil, but order vs chaos. The gods represent order and structure whereas the giants and the monsters represent chaos and disorder. 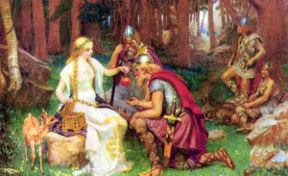 The origin and eventual fate of the world are described in Völuspá ("The völva's prophecy" or "The sybil's prophecy"), one of the most striking poems in the Poetic Edda. These haunting verses contain one of the most vivid creation accounts in all of religious history and a representation of the eventual destruction of the world that is unique in its attention to detail. In the Völuspá, Odin, the chief god of the Norse pantheon, has conjured up the spirit of a dead Völva ( Shaman or sybil) and commanded this spirit to reveal the past and the future. She is reluctant: "What do you ask of me? Why tempt me? "; but since she is already dead, she shows no fear of Odin, and continually taunts him: "Well, would you know more?" But Odin insists: if he is to fulfil his function as king of the gods, he must possess all knowledge. Once the sybil has revealed the secrets of past and future, she falls back into oblivion: "I sink now". In the beginning there was the world of ice Niflheim, and the world of fire Muspelheim, and between them was the Ginnungagap, a "grinning (or yawning) gap," in which nothing lived. In Ginnungagap, the fire and the ice met, and the fire of Muspelheim licked the ice shaping a primordial giant Ymir and a giant cow, Auðumbla whose milk fed Ymir. The cow licked the ice, creating the first god, Búri, who was the father of Borr, in turn the father of the first Æsir, Odin, and his brothers Vili and Ve. Ymir was a hermaphrodite and alone procreated the race of giants. Then Borr's sons; Odin, Vili, and Ve; slaughtered Ymir and, from his body, created the world. From his skull, Odin, Vili, and Ve created the vault of the sky, which was supported by four dwarfs: Austri, Vestri, Sudri, and Nordri. The gods regulated the passage of the days and nights, as well as the seasons. The first human beings were Ask and Embla ( ash and elm), who were carved from the wood of two trees and brought to life by the gods Odin, Hœnir/Vili, and Lóðurr/Vé. Odin gave them life; Vili gave consciousness; and Ve provided senses. Sol is the goddess of the sun, a daughter of Mundilfari, and wife of Glen. Every day, she rides through the sky on her chariot, pulled by two horses named Alsvid and Arvak. This passage is known as Alfrodull, meaning "glory of elves," which in turn was a common kenning for the sun. Sol is chased during the day by Skoll, a wolf that wants to devour her. Solar eclipses signify that Skoll has almost caught up to her. It is fated that Skoll will eventually catch Sol and eat her; however, she will be replaced by her daughter. Sol's brother, the moon, Mani, is chased by Hati, another wolf. The earth is protected from the full heat of the sun by Svalin, who stands between the earth and Sol. In Norse belief, the sun did not give light, which instead emanated from the manes of Arvak and Alsvid. 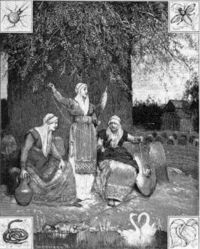 The sybil describes the great ash tree Yggdrasil and the three norns (female symbols of inexorable fate; their names; Urðr ( Urd), Verðandandi ( Verdandi), and Skuld; indicate the past, present, and future), who spin the threads of fate beneath it. She describes the primeval war between Æsir and Vanir and the murder of Baldr. Then she turns her attention to the future. The Old Norse vision of the future is bleak. In the end, it was believed, the forces of chaos will outnumber and overcome the divine and human guardians of order. Loki and his monstrous children will burst their bonds; the dead will sail from Niflheim to attack the living. Heimdall, the watchman of the gods, will summon the heavenly host with a blast on his horn. Then will ensue a final battle between order and chaos (Ragnarök), which the gods will lose, as is their fate. The gods, aware of this, will gather the finest warriors, the Einherjar, to fight on their side when the day comes, but in the end they will be powerless to prevent the world from descending into the chaos out of which it has once emerged; the gods and their world will be destroyed. Odin himself will be swallowed by Fenrir. Still, there will be a few survivors, both human and divine, who will populate a new world, to start the cycle anew. Or so the sybil tells us; scholars are divided on the question whether this is a later addition to the myth that betrays Christian influence. If pre-Christian, the eschatology of the Völuspá may reflect an older Indo-European tradition related with the eschatology of Persian Zoroastrianism. Sometimes the same hero resurfaces in several forms depending on which part of the Germanic world the epics survived such as Weyland/ Völund and Siegfried/ Sigurd, and probably Beowulf/ Bödvar Bjarki. Other notable heroes are Hagbard, Starkad, Ragnar Lodbrok, Sigurd Ring, Ivar Vidfamne and Harald Hildetand. Notable are also the shieldmaidens who were "ordinary" women who had chosen the path of the warrior. These women function both as heroines and as obstacles to the heroic journey. The Ancient Germans were above all other things a race of proud and noble warriors. Their legends abound in instances of heroism and bravery and through their mythology we see a society thaty was based around warfare and the love of battle. An old Germanic saying passed down was "Why get somthing with the sweat off my back that I can get with the shedding of my own blood? ", showing the perference of battle and plunder over (what we would call) an honest days work. The Valkieryes (Variable spellings exist of course) were the fearsome handmaidens of Odin and the warriors of Valhalla. The Valkieryes would fly over the battle feild and would take warriors who died in combat to Valhalla where they would feast during the evening and fight in the morning until they would be called together to fight on Ragnarrok. Depending on the Tribal version the Valkieryes would either pick the greatest of the warriors, who would then go into a selfless craze until they were killed, or any warrior who died in battle (furthermore some tribes believed that one simply had to choose to live a warriors life and could die anyway they pleased). Gamla Uppsala, the centre of worship in Sweden until the temple was destroyed the late 11th century. The Germanic tribes rarely or never had temples in a modern sense. The Blót, the form of worship practiced by the ancient Germanic and Scandinavian people resembled that of the Celts and Balts : it could occur in sacred groves. It could also take place at home and/or at a simple altar of piled stones known as a " horgr". However, there seems to have been a few more important centres, such as Skiringsal, Lejre and Uppsala. Adam of Bremen claims that there was a temple in Uppsala (see Temple at Uppsala) with three wooden statues of Thor, Odin and Freyr. While a kind of priesthood seems to have existed, it never took on the professional and semi-hereditary character of the Celtic druidical class. This was because the shamanistic tradition was maintained by women, the Völvas. It is often said that the Germanic kingship evolved out of a priestly office. This priestly role of the king was in line with the general role of godi, who was the head of a kindred group of families (for this social structure, see norse clans), and who administered the sacrifices. Despite the Shamanistic Völvas, this religion was not a form of Shamanism. Carl Larsson, "Midwinter Sacrifice", 1915: the sacrifice of King Domalde at Gamla Uppsala. Odin was associated with death by hanging, and a possible practice of Odinic sacrifice by strangling has some archeological support in the existence of bodies perfectly preserved by the acid of the Jutland (later taken over by Danish people) peatbogs, into which they were cast after having been strangled. An example is Tollund Man. However, we possess no written accounts that explicitly interpret the cause of these stranglings, which could obviously have other explanations. An 1830 portrayal of Ansgar, a Christian missionary invited to Sweden by its king Björn at Hauge in 829. An important problem in interpreting this mythology is that often the closest accounts that we have to "pre-contact" times were written by Christians. The Younger Edda and the Heimskringla were written by Snorri Sturluson in the 13th century, over two hundred years after Iceland became Christianized. This results in Snorri's works carrying a large amount of Euhemerism. Virtually all of the saga literature came out of Iceland, a relatively small and remote island, and even in the climate of religious tolerance there, Snorri was guided by an essentially Christian viewpoint. The Heimskringla provides some interesting insights into this issue. Snorri introduces Odin as a mortal warlord in Asia who acquires magical powers, settles in Sweden, and becomes a demi-god following his death. Having undercut Odin's divinity, Snorri then provides the story of a pact of Swedish King Aun with Odin to prolong his life by sacrificing his sons. 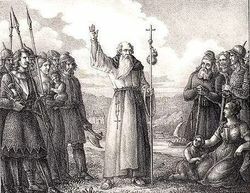 Later in the Heimskringla, Snorri records in detail how converts to Christianity such as Saint Olaf Haraldsson brutally converted Scandinavians to Christianity. One gruesome form of execution occurred during the christianization of Norway. King Olaf Tryggvason had male völvas (sejdmen) tied and left on a skerry at ebb. Trying to avert civil war, the Icelandic parliament voted in Christianity, but for some years tolerated heathenry in the privacy of one's home. Sweden, on the other hand, had a series of civil wars in the 11th century, which ended with the burning of the Temple at Uppsala. In England, on the other hand, Christianization occurred earlier and sporadically, rarely by force. Conversion by coercion was sporadic throughout the areas where Norse gods had been worshipped. However, the conversion did not happen overnight. Christian clergy did their utmost to teach the populace that the Norse gods were demons, but their success was limited and the gods never became evil in the popular mind in most of Scandinavia. Two centrally located and far from isolated settlements can illustrate how long the Christianization took. Archaeological studies of graves at the Swedish island of Lovön have shown that the Christianisation took 150-200 years, and this was a location close to the kings and bishops. Likewise in the bustling trading town of Bergen, many runic inscriptions have been found from the 13th century, among the Bryggen inscriptions. One of them says may Thor receive you, may Odin own you, and a second one is a galdra which says I carve curing runes, I carve salvaging runes, once against the elves, twice against the trolls, thrice against the thurs. The second one also mentions the dangerous Valkyrie Skögul. Otherwise there are few accounts from the 14th to the 18th century, but the clergy, such as Olaus Magnus (1555) wrote about the difficulties of extinguishing the old beliefs. The story related in Þrymskviða appears to have been unusually resilient, like the romantic story of Hagbard and Signy, and versions of both were recorded in the 17th century and as late as the 19th century. In the 19th and early 20th century Swedish folklorists documented what commoners believed, and what surfaced were many surviving traditions of the gods of Norse mythology. However, the traditions were by then far from the cohesive system of Snorri's accounts. 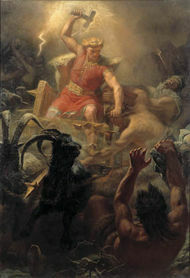 Most gods had been forgotten and only the hunting Odin and the giant-slaying Thor figure in numerous legends. Freyja is mentioned a few times and Baldr only survives in legends about place names. Other elements of Norse mythology survived without being perceived as such, especially concerning supernatural beings in Scandinavian folklore. Moreover, the Norse belief in destiny has been very firm until modern times. Since the Christian hell resembled the abode of the dead in Norse mythology one of the names was borrowed from the old faith, Helvíti i.e. Hel's punishment. Some elements of the Yule traditions were preserved, such as the Swedish tradition of slaughtering the pig at Christmas ( Christmas ham), which originally was part of the sacrifice to Freyr. The Germanic gods have left numerous traces in modern vocabulary and elements of every day western life in most Germanic language speaking countries. An example of this is some of the names of the days of the week: modelled after the names of the days of the week in Latin (named after Sun, Moon, Mars, Mercury, Jupiter, Venus, Saturn), the names for Tuesday through to Friday were replaced with Germanic equivalents of the Roman gods. In English, Saturn was not replaced, while Saturday is named after the sabbath in German, and is called "washing day" in Scandinavia. More recent have been attempts in both Europe and the United States to revive the old Germanic religion as Germanic Neopaganism, variously under the names of Ásatrú, Odinism, Wotanism, Forn Sed or Heathenry. In Iceland Ásatrú was recognized by the state as an official religion in 1973, which legalized its marriage, child-naming and other ceremonies. It is also an official and legal religion in all the Nordic countries, though it is still fairly new. Norse mythology also influenced Richard Wagner's use of literary themes from it to compose the four operas that make up Der Ring des Nibelungen (The Ring of the Nibelung) - inspiring and laying the foundation for numerous similarly inspired works. Subsequently, J.R.R. Tolkien's The Lord of the Rings was admitted by its author to be heavily influenced by the myths of the Northern Europeans. As that work became popular, elements of its fantasy world moved steadily into popular perceptions of the fantasy genre. In nearly any modern fantasy novel today can be found such Norse creatures as elves, dwarves, and frost giants.